This has been an unusual winter with late snow and unfortunately E2C was cancelled for 2015 just as we were preparing to publish this post. We’ll be looking forward to 2016!! Eco-Endurance Challenge (E2C) is a long-running annual outdoor adventure race and fundraiser for Halifax Regional Search & Rescue. It takes place every May. 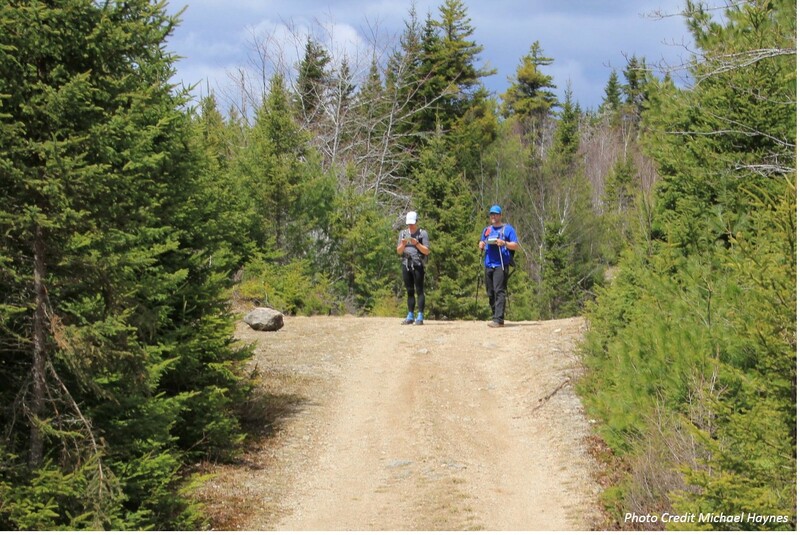 The race is described as a, “hybrid of classical orienteering, ultra-distance running and the navigational training practices of Search and Rescue Emergency Responders.” This will be the third year that it has been held just outside Halifax near the airport, with 60 checkpoints located in an area with over 100km² of “thick forests, wet bogs, fast flowing streams and miles of backwoods trails and cart tracks.” Teams of 2-5 can register for 8 or 24 hour races, in competitive or recreational categories. Participants in the recreational category are allowed to use navigational GPS. There are also special categories for Emergency Responders/SAR and Armed Forces. Teams use a combination of route planning and navigation to visit as many checkpoints as possible and return to the finish before the time expires. The checkpoints (controls) are orange triangular flags with unique punches to be marked on your team’s score card. Controls have different point values based on difficulty. Most are shown on the official 1:25,000 race map with a brief description/clue, but there are also always a few special challenges like distance bearing, line-O, or aerial map reading, for extra variety. 2015 will be our third year participating. In 2013 we barely knew how to use a map and compass but wanted to test our endurance, so we signed up for the recreational 24-hour category. We brought along a friend with navigation experience (Cody!) and also relied heavily on GPS. While using the GPS might be considered an advantage, it also meant that we went on one or two (luckily short) wild goose chases, from “typos,” or entering coordinates incorrectly into the GPS. We also followed the GPS basically point to point through some of the toughest areas of Hurricane Juan deadfall (around Burnt Lake for anyone who remembers!) rather than navigating by reading the map features and topography. This was also the year we brought a tarp and spent a few hours sleeping only to wake and find our sneakers frozen solid, despite the forecasted low of +3ºC. Luckily it warmed up quickly in the morning. We were pretty exhausted by the end, though we managed to finish in second place, which I guess means that our first attempt was a success. The 2013 Misadventurers take 24hr recreational 2nd place! Wade’s sunglasses are shielding his extremely painful left eye, which was a few hours away from being diagnosed with a huge corneal abrasion that he sustained early in the first day. By the time 2014 came around we had learned a lot about navigating, map-reading and route-planning. We decided to forego the GPS and test our skills with just the two of us, in the 24-hour competitive category. We knew there would be no medals in our future this time around! Our goal was to beat our point total from the previous year without the GPS. We did improve on our point total in 2014, but after the fact realized that we’d made some poor choices with our route planning. This was in part because we failed to read some of the clues which would have shown us that some of the higher point-value controls were actually quite easy to find and closer together than we would have ever imagined. With a better plan we should have been able to get significantly more points for the same amount of effort. Lesson learned… review the map AND all the clues before deciding on a plan next time. So, on to 2015…. May 2 is coming up fast! Can’t wait to see how high up in the trees the controls are this year… we may be dragging along a ladder. The course setters do a lot of work in the winter and this year has been a doozy. Snow, snow and more snow. ← Orienteering and Adventure Racing 2015!